Note: This review was originally published on February 10. An addendum has been added about the blu-ray release. BLU-RAY ADDENDUM - Like the film it showcases, the Cinema Guild's blu-ray release of The Turin Horse is breathtaking. For those who have already experienced Tarr's masterwork, revisiting it in high definition will be a real treat, and it's nearly impossible not to become lost in its peculiar reality all over again, especially with the crisp black and white cinematography on full display. Those coming to the film for the first time are likewise in for something special. While I love the special features on The Strange Case of Angelica, The Turin Horse may be the most beautiful blu-ray the company has released. Tarr himself gets a lot of face time on the supplements, which include a press conference with the movers and shakers behind the film as well as an exclusive 80 minute chat with Tarr available only on the blu-ray. The centerpiece supplement, however, is Tarr's 1978 short film, Hotel Magnezit. Telling the story of an old man being evicted from a hostel, and the subsequent blame game played by his fellow boarders, Hotel Magnezit is an interesting early indicator of Tarr's keen sense of shifting emotional undercurrents. The film itself looks like it was transferred from a VHS, which is a shame considering how gorgeous The Turin Horse is, but it's unlikely that a better quality copy was available for transfer. It's a minor squabble in an otherwise stellar package, because the year's best film has been given the blu-ray treatment it so richly deserves. It is a narrative that must be wholly surrendered to, and this stunning transfer makes the journey all the more fulfilling. 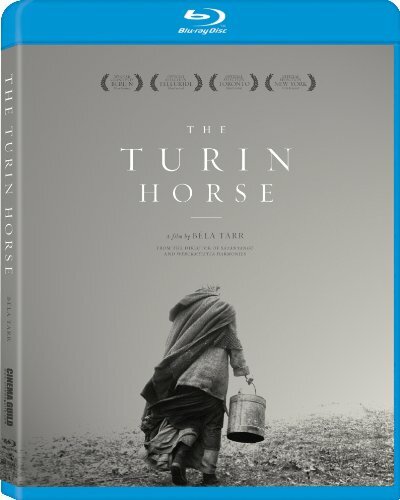 THE TURIN HORSE | Directed by Béla Tarr | Stars Janos Derzsi, Erika Bok, Mihaly Kormos | Not rated | In Hungarian with English subtitles | Now available on blu-ray and DVD from the Cinema Guild.